Finding the best dog toys for a Rottweiler can be quite a challenge. Here's why? For one they have the highest bite force and second being a large breed they can destroy a toy in less than a minute! They are passionate chewers and a brand new toy can turn from a squeaky duck into shreds of yellow plastic within a matter of minutes increasing the risk of ingestion. So, what are the best toys for such big-boy aggressive chewers? We did the hard work, so you don't have to. Read on to find out why we have chosen those toys over others and save yourself some dough and your Rottie the frustration of a cheap toy that falls apart easily. Always supervise your Rottie when he gets a new toy. 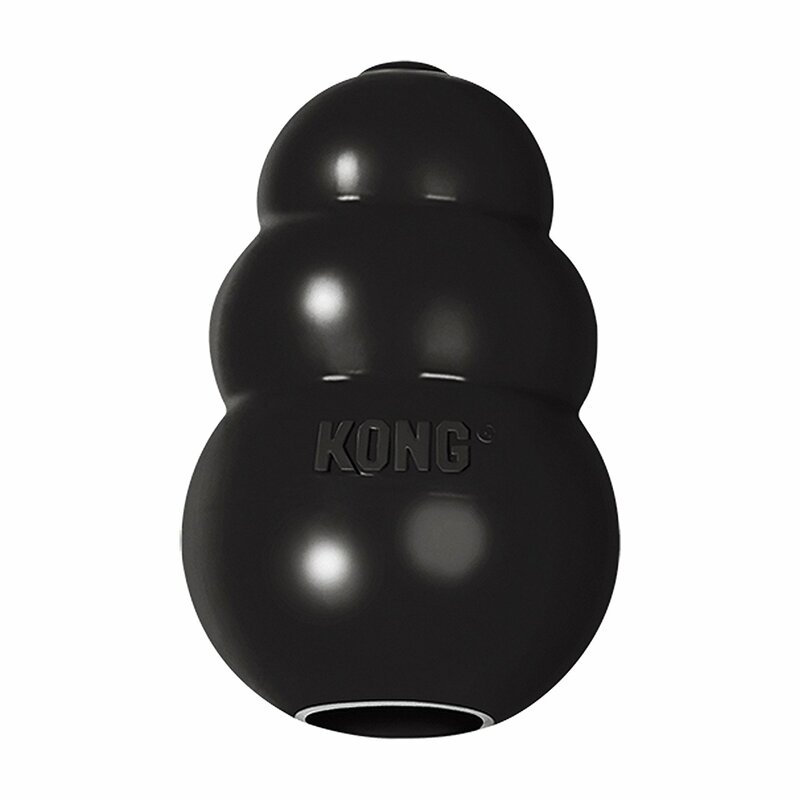 The KONG Extreme is our most recommended dog toy for aggressive chewers. For your Rottie puppy they even have PUPPY Kongs made from a softer rubber. We like the KONG because they make great treat toys too. We like to stuff ours with peanut butter, veggies & fruits and their favorite dog treats. In the summer we especially like to freeze ours and our pup just goes mad over it. This toy will withstand your Rottie’s jaws. It’s made from durable rubber material that is non-toxic and safe and most of all puncture-proof to avoid from being easily shred to pieces. We’ve had the KONG Extreme for a few years now and can say it has outlasted most of the other toys by a long shot. If you have an over-enthusiastic Rottie at home that loves a challenge and no toy is too big - try this colossal-sized rope tug toy from Mammoth for breeds 50 pounds and over. This over sized 25-inch rope Monkey Ball toy is great for hard-core chewing sessions or as a normal tug rope toy. The big knot in the middle is around 5-inches in diameter, the size of a cantaloupe is what a customer described it as! The rope is great for keeping your dogs teeth and gums clean and as a toy we're sure you'll find it tough, durable and pretty indestructible as most toys from Mammoth are. Another KONG, another great toy! This toy is particularly good if your dog eats his food too fast or he might need extra stimulation because he gets bored easily. You fill the wobbler with kibble or treats and your dog has to tip it and move it to get the goodies dispensed. All pet parents own a few of the KONG toys, since they last, and this one was the first we bought. We like to switch the toys around regularly to make things more interesting and prolong the novelty of a “new” toy. The KONG Rubber flyers is the most reliable Frisbee toy when it comes to a 132 pound dog with jaws made of steel! 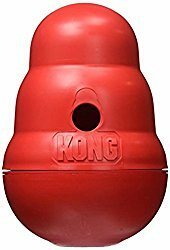 As you have figured out by now, the KONG toys are among our favorite because they last longer than most other toys! Rotties have a lot of energy and stamina which they need to burn off, so they are perfect dogs to play fetch or Frisbee with. 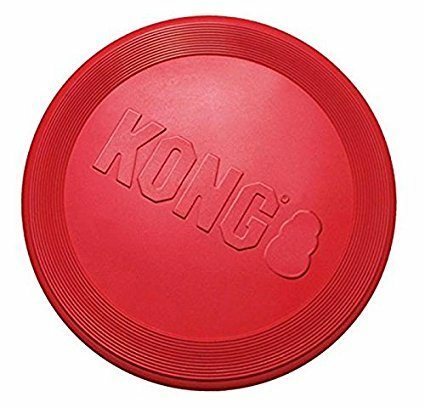 Toys like the Kong Rubber Flyer are specially made to be durable, yet soft enough for dogs to catch without hurting their teeth and gums compared to other toys. The flexibility of the toy is something we like because when finished playing it can be rolled and folded it away for easy storage. Antlers are a safe chew treat for your Rottie and judging from other customer reviews,we are not the only ones thinking this way. If you want to stop your couch from being chewed on have a look at this dog chew treat- the Deer Antler Dog Chews. As Rotts are avid-chewers, this strong dog chew treat is all natural and doesn't splinter or crack. 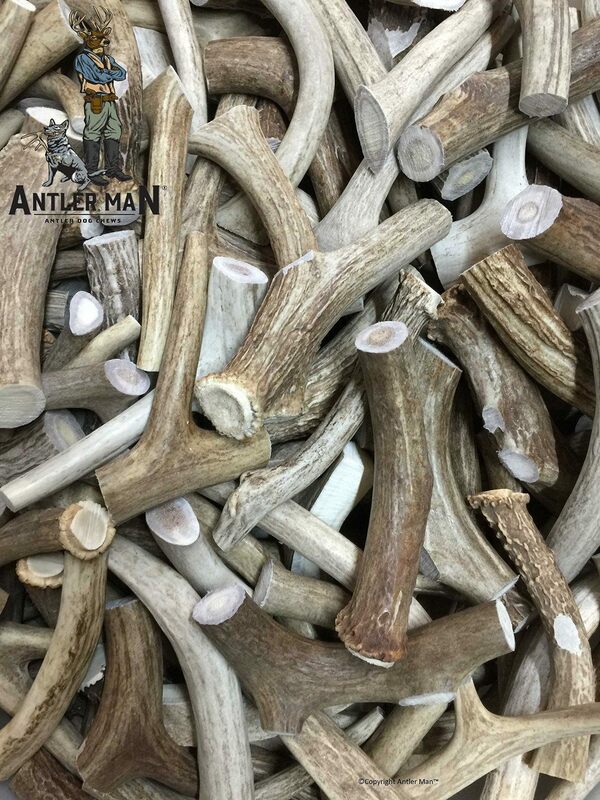 They are real antlers and contain potassium, zinc, calcium and manganese so they are super healthy for your Rottie. They don't have any sharp edges and are not brittle and dogs just seem to go crazy for them. Rotties love running chasing balls. 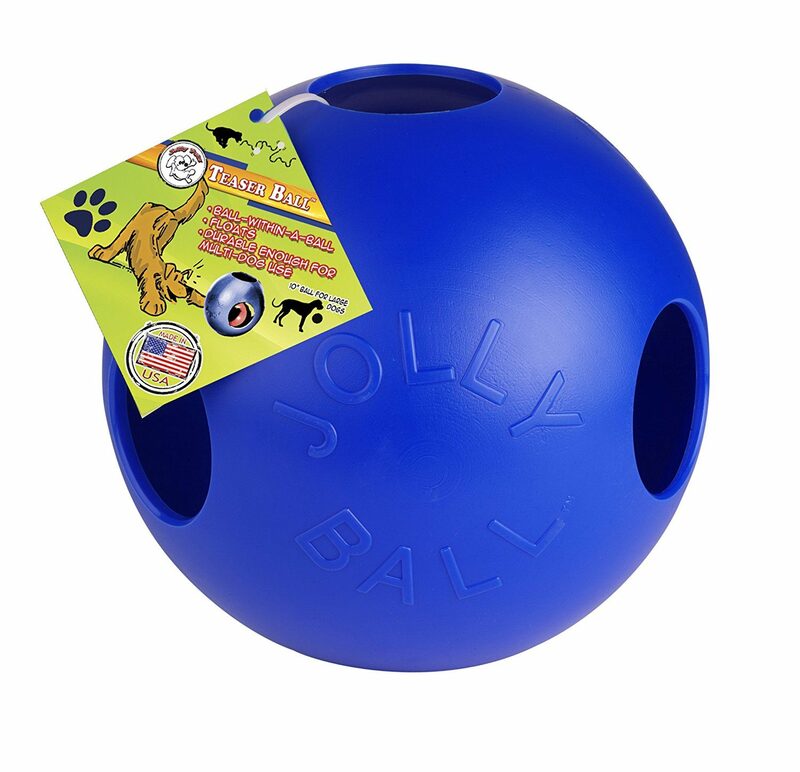 But not all play balls are equal and if you are looking for the most durable puncture proof ball with ton of wear and tear we can’t speak highly enough of Jolly Pets. Initially these jolly bolls were intended for bored horses, but dogs just seem to go nuts for them. These ball teasers are great for aggressive, strong chewers. The ball teaser can be easily nudged, rolled and of course chased. Your Rottie can play with it on its own without you having to initiate play time. It is large enough so it’s perfect for this breed size - available in sizes 8" and 10". The teaser ball is made from super hard plastic which doesn’t come apart remaining intact. Overall another great chew toy to help your Rottie get his exercise fill for the day and at the same time provide great entertainment. Rotties don't deserve their bad reputation. In fact this breed is highly intelligent, child-friendly, and hardworking dog breed. Since Rottweilers have a history of being herding dogs, they are good at dog sports like agility, tracking, herding, and obedience. This is a bigger breed that needs to be trained well to avoid aggression and behavior issues, so they need a lot of their owner’s time. For pet owners who have the time to devote to their Rottweilers, they will have very loyal, confident, and protective member of the family. Rottweilers are medium to large size dogs with big heads, small triangular ears, muscular bodies and broad chests. They have short, thick black coats with markings on their face, legs, and feet. This breed came to Germany during the British Invasion and is one of the oldest known herding breeds. That's impressive! Having proven their worth as working dogs, Rotties also commonly serve as police dogs, service dogs, and guard dogs. That feels very securing to hear! Rotties are an adaptive breed that can live comfortably in apartments if they are taken outside for regular ﻿﻿﻿﻿﻿﻿exer﻿﻿﻿﻿﻿﻿cise. Early training and socialization is important for Rottweilers to avoid aloof or aggressive behavior towards other people and pets. The best way to train this sensitive breed is with rewards-based training using treats and favorite toys. This self-assured and intelligent dog needs to be kept busy with tasks and exercise so they don't get bored. Their high energy is perfect for owners who like to run, take part in other athletic activities or go on hiking or backpacking trips. When left at home, it's best to leave them with some interactive or puzzle toys to keep their minds stimulated and keep them out of trouble (save your couch from being teared to shreds). Rotties have endless energy to burn, any owners knows that, so why not let them get some fun and exercise with a game of Frisbee? This activity gives owners a chance to relax while their dogs run to their heart’s content. There are even Frisbee competitions, where owners train their dogs to catch high and low shots or do tricks like flips and spins! Another activity that Rottweilers will always be up for is a game of fetch, or chasing a ball around. One good game to play is Belly Ball, where a small group of people try to get a ball under the dog’s belly. Since Rottweilers are larger dogs, owners can use a bigger ball like a soccer ball – it’s a blast! Not only is it important to manage a Rottweiler’s energy levels, but owners should also make use of mental games to make sure that their dog truly feels happy and fulfilled. Rottweilers are bored easily and love to learn, so take the time to see if they enjoy things like o﻿﻿bedience trainin﻿﻿g or agility courses. Owners can also have them do jobs around the house like fetching the mail or picking up toys and placing them where they belong. Cheap dog toys are exactly that. Cheap! Meaning poorer quality, unsafe and guaranteed to be shredded by your Rottweiler. Not to mention, a waste of your money. Rottweilers are a very strong breed with herding and hunting instincts, so they are likely to tear a cheap squeaky toy apart for the prize in the middle – a small piece that they could potentially choke on. Other plush toys are filled with harmful substances that dogs can swallow. Look for unstuffed alternatives or squeaker chew toys that are more durable and make sure you throw any toys out that start to wear or break. Rottweilers are great dogs, especially if you have them exercising and staying busy. This breed can make a great family pet if owners have time to dedicate to training them and giving them regular exercise. When looking for toys for your Rottie, pet owners should find brands that focus on durability as well as toys that are known for keeping dogs mentally stimulated and entertained.